the HAES files: what do we mean by health? What do we mean by the “health” in the Health At Every Size® paradigm? Let me be clear: I do not think it’s necessary for all of us who advocate for the HAESSM paradigm to mean the same thing by “health.” I do think, however, that many of us (myself included) have been limiting ourselves and our message by engaging with a limited definition of health, with unfortunate consequences. An unexamined definition of “health” puts us at a higher risk of committing “healthism” in at least two important ways. The term “healthism” was first coined in 1980 by sociologist Robert Crawford to describe a “preoccupation with personal health as a primary – often the primary – focus for the definition and achievement of, well-being.” The intervening years have seen only an intensification of this trend, and the term has come to include a moral dimension. These days, we are found morally wanting if we are “unhealthy.” A generation after he first described it, Crawford in 2006 noted how far the healthism meme has evolved, observing that we now tend to use good health as a measure of an individual’s value as a person and a citizen. It has become commonplace to observe that we live in youth-obsessed, thin-obsessed, appearance-obsessed culture; health needs to be included on this list of normative values that we use to measure each others’ worth. Lest you think I am exaggerating, read this recent blog post (if you have the sanity points to spare). Entitled A Civic Duty to Be Healthy, it’s written by a dietician who asserts that “nobody should consider good health as a purely personal matter that is nobody’s business but his or hers. We all have a civic duty to maintain our health as best as we can and not unnecessarily burden society with the consequences of poor lifestyle choices.” The sorry truth is that this type of rhetoric is all too common. It gets invoked in any discourse around health care reform, health insurance, public health policy, and anywhere else people feel they are entitled to take an interest in other people’s health. Healthism takes many forms, and we should be worried about all of them. People whose size is perceived as transgressive (whether too fat or too thin) are prime targets of the healthist lens. Fat people who refuse to diet are seen as irresponsible and a burden on their neighbors’ health insurance bill. However, there are two particular forms of this insidious meme that particularly concern me because I think we (and I include myself in this “we”) in the HAES and size acceptance movement unwittingly wield them against ourselves and each other. 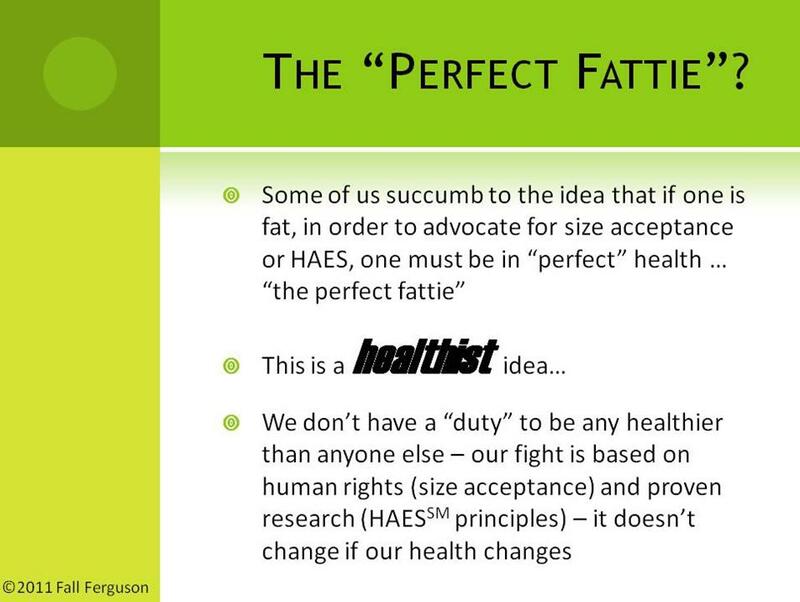 I participated in a panel on healthism at the 2011 ASDAH conference where I showed this slide identifying what some of us call the “Perfect Fattie” phenomenon as a form of healthism. (Click here to see entire presentation.) Some of us fall into the trap of believing that we need to be in perfect health in order to advocate for the HAES principles or equal rights for people of all sizes. This is just plain wrong: none of us has a “duty” to be any healthier than anyone else. Our work is based on human rights (size acceptance) and proven research (HAESSM principles), and that doesn’t change if our health changes. By the way, everyone – whether fat or thin – gets sick, and I hate to be the one to break it to you, but we all die too, so we need to get over it. Don’t get me wrong. It’s important for us to acknowledge and publicize the fact that many fat people do enjoy excellent physical health and are very fit according to the traditional health indicators. This is powerful anecdotal evidence that the known correlations between “obesity” and various chronic health conditions are just that, and not proof that being fat causes these conditions. The danger is that when one of us declares, “Look at me – I’m fat and I have perfect blood pressure/cholesterol/blood sugar, etc.,” some of the rest of us get worried because we don’t. Does one individual’s health condition change what we know about HAES science? Of course not; my point is that we are all entitled to speak up, whether or not we have health conditions that the medical establishment and the public associate with fatness. We spend a lot of time talking about the fact that it’s healthy habits and lifestyle that matter for health, and not body size or weight. Sound familiar? I have read that in many writings by HAES advocates. I have said it and written it myself. And I am not saying we’re wrong, just that this is an incomplete picture of health. Emphasizing the evidence that healthy habits and lifestyle rather than weight loss are what have the power to improve everyone’s physical health is an excellent strategy, especially when we are dialoguing with health professionals and others who are caught up in the weight loss paradigm. But by not talking about other aspects of health, we risk alienating many whom we want to reach, namely, the victims of that same paradigm – chronic dieters and disordered eaters, folks who loathe their own bodies, and anyone who has ever been lectured by a health professional to “just eat better” and “just start exercising” in the pursuit of weight loss. And for anyone who has been stigmatized as unhealthy in our healthist society, our emphasis on how to achieve physical health may sound like more of the same. When we are faced with the complexity of the human experience in a one-on-one setting, most of us readily apply the above-quoted principle. We see each other and our clients as complex and fascinating human beings with all these dimensions to their experience of health and well-being. But is this recognition reflected in how we talk about HAES issues publicly? Despite my conviction that we are applying this idea of multi-dimensional health in practice, I don’t often see it reflected in our rhetoric about the HAES approach. It’s not that we never bring it up, but this part of our message too often goes unnoticed or unmentioned. I worry that allowing that to happen is tantamount to engaging in physiological essentialism – talking about health as if physiology is all that matters. Health is a cultural construction, not a “fact” that can be defined in terms of science. Yes, we are engaged in a debate over the scientific evidence, but there is a deep cultural divide that needs to be bridged as well. If we tacitly accept a concept of health that focuses almost exclusively on physiology, then we may be subtly participating in healthism and supporting the very paradigm that we are seeking to change. Linda Bacon has suggested that the HAES approach is “the new peace movement.” This is a brilliant reframe of the rhetoric of the “war on obesity.” Maybe we need a similar type of reframe around physiological essentialism and the definition of health. Can we bring a recognition of the multi-dimensional nature of health to our rhetoric without losing our clarity around the physiological evidence that supports a HAES approach? Is there a way to do it without alienating the health care professionals we would like to convince to abandon the weight loss paradigm for a health-based approach? I don’t have all the answers to these questions, but I am going to try to continue to sort them out. I have already started working on another post about some of the other dimensions of health. Meanwhile, I would love to hear what you all think.